An ear infection is often a viral or bacterial infection affecting your middle ear. This is the air-filled area behind your eardrum containing the very small vibrating bones of your ear. Kids tend to get ear infections more than adults. Ear infections are also usually painful due to the buildup of fluids and inflammation in the middle ear. The accumulation of fluid inside your ear canal can damage your ear canal's protective layer. This is known as swollen ear canal and is a condition of the ear associated with redness and inflammation inside the canal. Lipid makes up the protective layer. The inflammation causes your ear to feel warmer on the inside, narrowing the canal. Another term for swollen ear canal is "swimmer's ear" since it's a common condition many swimmers deal with because they're in the water a lot of the time. Since ear infections sometimes go away on their own, treatment might start with monitoring the condition and managing your pain. Severe cases of a swollen ear canal and ear infection in babies generally require antibiotics. Certain long-term issues of swollen ear canal like persistent infections, persistent middle ear fluids or frequent infections can lead to hearing issues and other complications. Cleaning your ears too frequently. Using headphones that plug your ears for long periods. Using cotton balls to clean your ear. Getting scratches in your ear's inner walls. Putting things in your ear can cause this condition too. Don’t put things like pen caps, hairpins or your fingers in your ears. Even hearing aids can cause swollen ear canal if moisture gets trapped in the ear canal. Seborrheic dermatitis may also lead to the condition. It’s a skin condition where your skin becomes irritated because of a mucous coating over it. A greasy substance secretes inside your ear in a swollen ear canal case. The mucous covering leads to seborrheic dermatitis that leads to infection. have a greater risk of ear infections. An allergic reaction can also cause swollen ear canal. Certain substances like excessive sweat, shampoo, certain medications and soapy water can cause an allergic reaction that leads to the condition. Weaker immunity caused by certain conditions like AIDS may also cause you to be more susceptible to ear infections. If you're being treated for cancer with chemotherapy, you're at a great risk of ear infections. Fungal infections can lead to swollen ear canal. In fact, it’s a common cause of the condition. Candida albicans and different types of Aspergillus are the common fungus that can cause fungal infection. Some individuals have narrow ear canals, which make moisture draining more difficult. When water gets trapped it can promote bacterial growth and infection resulting in ear canal swelling. If you notice any symptoms or signs of an ear infection, see one of our Houston ENT doctors. You'll also want to give us a call if you have ringing in your ears or you feel dizzy. This could mean you have a more severe problem that our doctor will need to evaluate. You'll also want to see our doctor if you are experiencing severe pain. We can prescribe you medication for relief. Developmental or speech delays. If hearing becomes impaired temporarily or permanently in toddlers and infants, they could experience developmental, social and speech delays. Impaired hearing. Ear infections can often cause mild hearing loss that will come and go, but once the infection clears, the hearing should go back to normal. Persistent infection or fluid buildup in your middle ear can cause more substantial hearing loss. If your eardrum has permanent damage or there's damage to other middle ear structures it could lead to permanent hearing loss. Tearing of your eardrum. Eardrum tears tend to heal within 72 hours, but some do require surgical repair. A spread of an infection. Infections left untreated or those not responding to treatment very well can spread to neighboring tissues. Infection of your mastoid (bony protrusion behind your ear) is known as mastoiditis and can cause bone damage and pus-filled cysts. Serious middle ear infections rarely spread to other skull tissues like brain membranes (meningitis) or your brain. You have a few treatment options for a swollen ear canal, which depend primarily on the cause. Your doctor will use a small device or suction to clear away earwax, debris or extra skin and drain water. They need to do this to allow the prescription antibiotic eardrops to move through the infected ear areas freely. Depending on the swelling or blockage, your doctor might insert gauze or cotton in your air to promote drainage. If an infection is causing your swollen ear symptoms, our doctor will treat the infection with medication and allow the ear to heal. To treat fungi and bacteria, your doctor will give you a prescription for eardrops. These drops also help restore the normal pH balance of your ears and reduce inflammation. 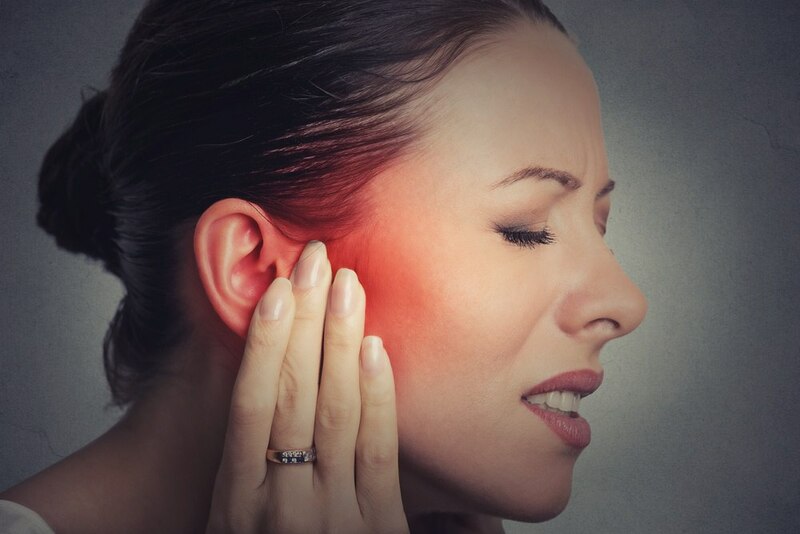 If an infection isn't causing your swollen ear symptoms, but instead environmental causes, like having a sensitivity reaction or an insect bite, our doctor will prescribe you medicine that soothes the inflammatory reaction that's causing your swelling. The most essential steps to prevent swollen ear canal is to not use cotton swaps and keep your ears dry. For people who are frequently in the water, like swimmers, place alcohol drops in your ear canals to evaporate moisture after swimming. You can also dry your ear canal with a hairdryer. Proper treatment of your swollen ear canal should get rid of any complications. Don't hesitate to receive treatment or you losing your hearing or the infection spreading to other areas of your head. If you suspect swollen ear canal, request an appointment with one of our doctors and Houston ENT & Allergy Services right away. Call us at 281-623-1312.